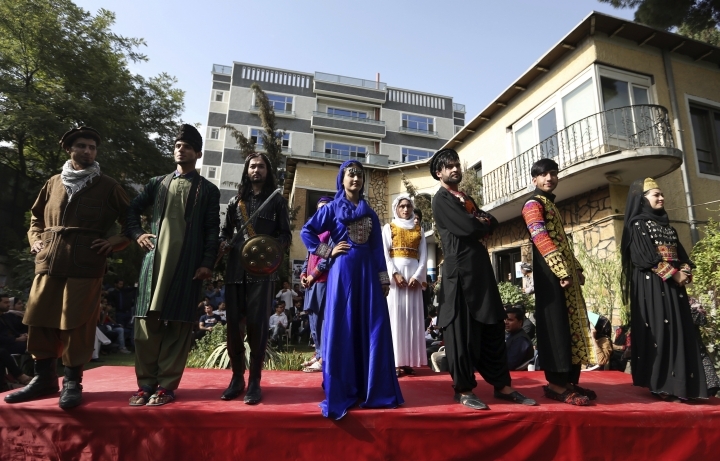 KABUL, Afghanistan — Amid tight security, over two dozen young models, including six women, strutted down the catwalk in the garden of a private Kabul villa, proudly displaying the traditional clothing and costumes of Afghanistan's many ethnic groups. The audience, about 100 men and women, tightly packed the small space on a recent afternoon, but the mood was as bright as the models' embroidered tunics and scarves — a scene that would have been unimaginable under Taliban rule. 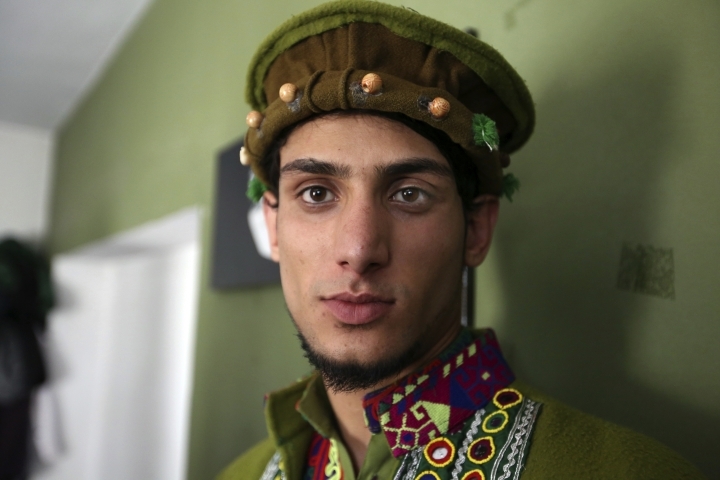 For the organizer, 22-year-old model and fashion designer Ajmal Haqiqi, putting on the show was worth the risk — despite daily threats of militant attacks in this war-weary capital. 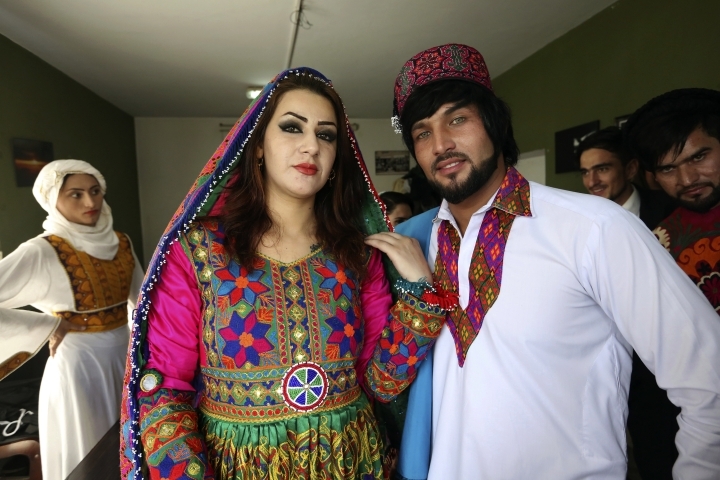 Haqiqi says he was motivated by the desire to show off Afghan culture through the nation's dazzling abundance of traditional garments and regional costumes. If Afghans regain an awareness of their rich heritage, this could help unite them, he said. "I told myself, if a suicide bomber attacks us, even if I lose my hands and feet, I will continue on the way that I have chosen," an exuberant Haqiqi told The Associated Press after the event. 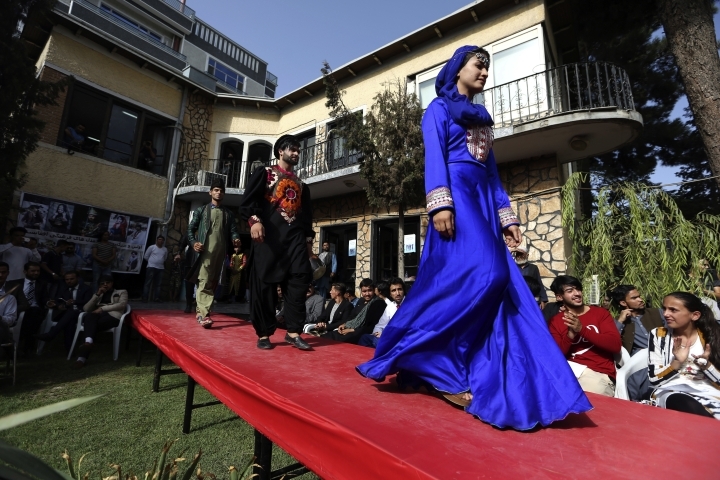 Kabul has seen few fashion shows over the past years, mostly catering to international audiences. Haqiqi's show was the first all-Afghan enterprise: Afghan models showing Afghan traditional clothing to an all-Afghan audience. However, the idea of women on display remains mostly taboo in Afghanistan, more than 16 years after the 2001 U.S. assault that ousted the Taliban from power after a repressive five-year reign. Some women still don't go outside without wearing blue burqas that cover them from head to toe, leaving only mesh over the eyes. 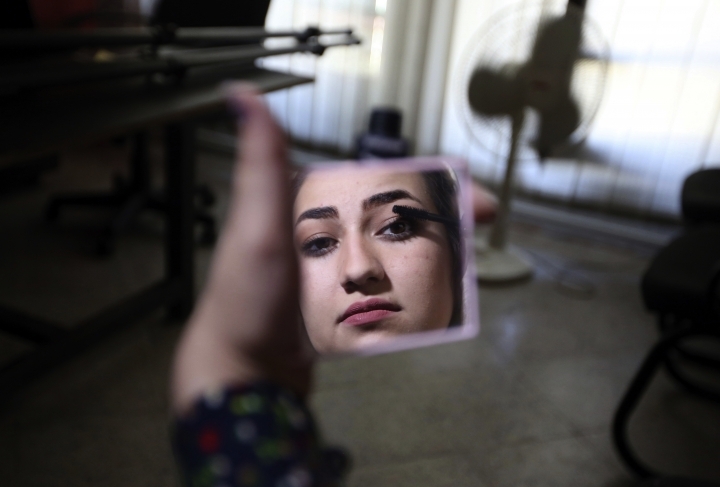 Violence against women is still common, and there are reports of women being stoned, executed in public or imprisoned for having affairs with men. Women have even set themselves on fire to escape domestic violence. Haqiqi's group, the Haqiqi Modeling Agency, is a relative newcomer on the country's small fashion scene but he has appeared on national television on various occasions, such as Independence Day, the Persian New Year, known as Nowruz, and the Muslim holidays of Eid al-Adha and Eid al-Fitr. The agency sells the designs under its own "Haqiqi Brand," with about 70 percent of the sales going to foreigners and Afghans living aboard. Atefa Fasihi, 21, joined Haqiqi's team two years ago and the show was her debut before a live audience. She acknowledged feeling uneasy as heavily armed security guards protected the villa in a western Kabul neighborhood. "Everybody is scared, but ... we are working to promote our Afghan culture, so I foresee a good future," Fasihi said. Husna Sadat, who was in the audience, said the prospect of more such shows is exciting. "If we can change the mentality of our people from all these years of fighting, then I am sure the people can be ready for a better future," she said. Kabul has been battered by attacks over recent months, most claimed by the Taliban but some also by an Islamic State affiliate. Last month, a Taliban suicide bomber rammed his car packed with explosives into a bus carrying government employees in the same western Kabul neighborhood where Haqiqi's show took place, an area that is home to several private schools and where many politicians reside. The rush hour attack killed 24 people and wounded 42 others. And on May 31, the city saw its worst suicide bombing since the Taliban collapse — an attack that killed 150 people and wounded scores. But it was all smiles at the fashion show. The male models showed off Afghan variants of the shalwar kameez, the men's long shirt and pants also known as perahan tunban, with turban, pakul or karakul hats. The women wore colorful gand-e-Afghanis, made from softly flowing and intricately embroidered materials, some with matching scarves. For Amina Sherzad, also in the audience at Haqiqi's show last week, the mix of the ethnic garments held a message of acceptance. "It shows that we can accept each other, a model can be a Tajik or a Hazara but can wear the other's ethnic clothing," she said, referring to two prominent ethnic minorities. "We are the same."